If there’s one thing we can tell you about taxes that will probably never change it’s this: there are many laws governing them. So what you won’t get from us is complete details about taxes; for that, the Internal Revenue Service (IRS) is your best source of information. Learn everything you ever wanted to know about taxes and more at the IRS website. W-4 – You’ll be asked to complete this form when you begin a new job. You complete this form so that your employer can withhold the correct Federal income tax from your pay. 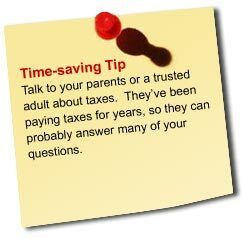 Because your tax situation may change, you may want to refigure your withholding each year. Visit the IRS website for more details. Form W-2 (Wage and Tax Statement) – This form lists your wages earned and taxes withheld for a calendar year. You will receive this form from your employer within the month of January each calendar year. (For example, in January 2000, you would have received your Form W-2 for the year 1999.) Use the information on this form to help you file your taxes at the federal, state, and local / city levels. Visit the IRS website for more details. Form 1040 (U.S. Individual Income Tax Return) – When it’s time to file your taxes (for the April 15 deadline!) you’ll need to use a Form 1040. If you have no dependents (e.g., children) to claim on your taxes, you can probably file a Form 1040EZ. Just as the name suggests, it’s easy to complete. It’s intended for single and joint filers with no dependents. Visit the IRS website for more details.